lahznimmo architects and Wilson Architects were awarded the commission for the new Lowy Cancer Research Centre at the University of NSW through a short listed paid competition process. This Research Facility is a joint venture between the University of NSW, Faculty of Medicine and the Children’s Cancer Institute Australia (CCIA), bringing together childhood and adult cancer research on the one site. Also underpinning the project is the primary objective of providing a "flexible and evolving research facility" which will be able to adapt to the inevitability of constantly evolving and variable research programming. The building by virtue of its function divides naturally into a more formal but flexible “Laboratory Box” containing labs, support space areas and floor by floor plant and then a more fluid “human strand” containing write up spaces and a variety of areas for break out and collaborative work. The building adopts the strategy of expressing “science to the street” and “people to the courtyard”. The main focal and social space in the building is an atrium space, which uses the metaphor of the “science knowledge bank”. This space looks directly in the laboratory floors and contains all vertical circulation, breakout and meeting spaces. The atrium forms a part of the “human strand” and connects on four levels via an occupied bridge link to the existing Faculty of Medicine Building. 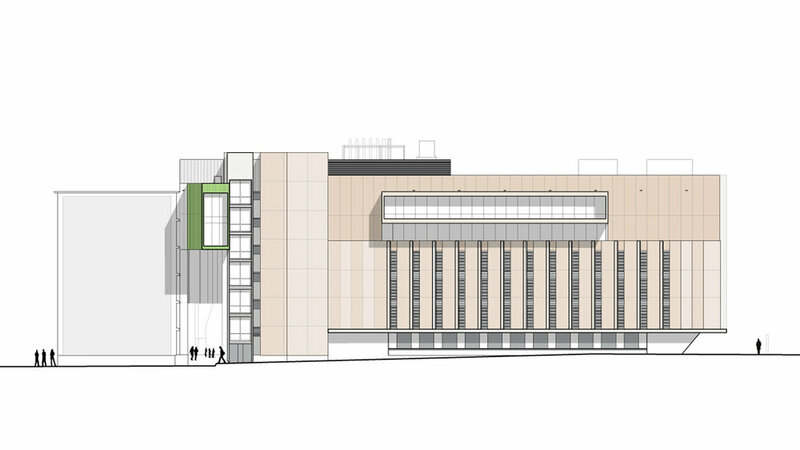 This linking element physically connects the lift cores of the two buildings maximizing the potential for collaboration between the Faculty of Medicine and the Research Facility.